Halloween is always such a fun holiday but with our family having a peanut allergy a lot of the candy that's end up in the parent pile as we seem to get A LOT of peanut treats in our neighbourhood. I recently came across the Teak Pumpkin Projuct and thought it was a great idea for kids like mine and was on the lookout for great treat ideas that are not candy. I was so excited when I found that Hasbro offers Playdough treat packs with little tubs of Halloween colored Playdoh! What a great alternative and sure to be a big hit with the kids! Hasbro also offers many great options that go from toys to costumes like the Spider man masks and the Iron Man mask and sound activated hands! My boys are Huge super hero fans and play dress up all the time, so would just love to have these and it saves mom and dad money on those overly expensive costumes! I also checked out the Doh Vinci pumpkin set. 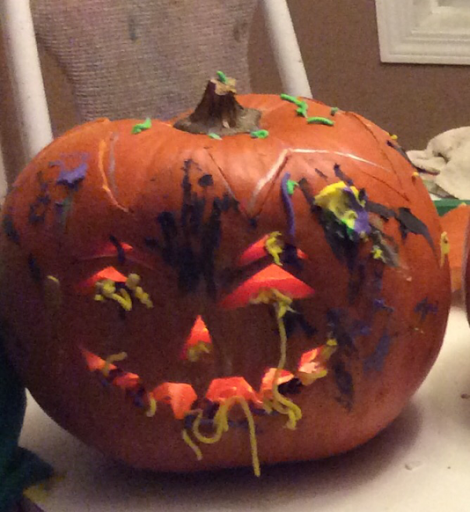 My boys had a great time decorating their pumpkins with it! Although it looks nothing like it us supposed to and they took it a completely different way it looks great and they had a blast!